Our Two-Tone Soft Shell Jacket takes on the wet, windy world with function and style. Made with polyester interlock bonded to polyester fleece, this soft shell breathes to keep you comfortable and has amazing stretch to keep up with your active lifestyle. Rated for protection against water, it's ready for whatever adventure your day holds. 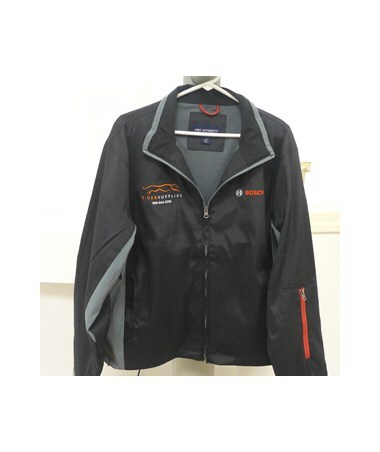 100% polyester interlock surface with lamination bonded to 100% polyester fleece. 3000MM waterproof rating. 3000G/M² breathability rating. Storm flap with chin guard. Front zippered pockets. Open hem with draw cord and toggle for adjustability. Embroidered – 2 color Bosch logo on left chest.